Fish is a staple in the G&D household. 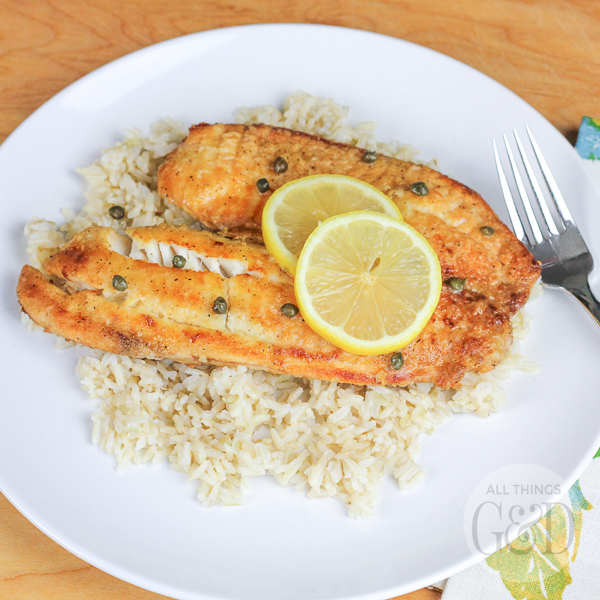 It makes our menu more often than chicken, beef, or any other protein source, and this healthy Tilapia Piccata recipe is one of our favorites! The Wisconsin girl in me drools over a good Friday Night Fish Fry, so I love white fish that’s been dipped in beer batter, deep-fried, and all crunchy on the outside. My husband (and my arteries) hate fish that’s been coated, and prefer a healthier variety. This Tilapia Piccata recipe is a our compromise! It’s dusted with flour and seasonings so I get my crunch, yet it’s light enough that G (and my arteries) like it, too. The piccata “sauce” topping that you drizzle over it is fresh, crisp, and lemony and tastes like a little flavor party in your mouth. This recipe includes white wine, which is always a winner in my book. A splash for the pan, and all the rest for me! CLICK HERE to snag my recipe at Homes.com and enjoy this yummy Tilapia Piccata (and leftover bottle of wine) on your menu this week! Interested in more healthy food options? Be sure to also visit my list of 8 Healthy Food Items to Have on Hand!